AD.com: Welcome to AuthorDiscovery,com, Richard. We’re big fans of your book Collapse over here and eagerly awaiting the follow-up, Resistance (due July 15, 2013). Collapse was your debut novel, yet you have a presence and following usually reserved for authors with 5-10 books out as evidenced by your mind-boggling 358 Amazon reviews alone! Reviews are one of the most important element of early author discovery, how have you managed to get so many reviews? RS: I am honestly shocked and amazed by how many reviews I have received. I will say that the majority of my reviews immediately follow free promos, most of which are extremely successful given that I sink a decent percentage of my royalties into advertising them. I’m also not shy about asking fans for reviews. Let’s be clear, I don’t fish for reviews and beg for them. If a fan reaches out to me by email, Facebook, or Twitter and tell me how much they enjoy the book, I ask them to leave a review on Amazon. Sometimes they do, sometimes they don’t. AD.com: You are one of the most active authors on twitter with over 30,000 tweets sent and over 37,000 twitter followers amassed (talk about GETTING FOUND!). How long have you been on twitter and what has been your strategy to getting so many twitter followers? RS: I’ve been on Twitter for a little over a year. The key to my Twitter success has been the program TweetAdder. It does all the heavy lifting for me. I target book readers by searching for key terms like “book suggestion” “good read” “booknerd” “booklover.” I also target readers of my genre with keyword searches like “dystopian” “apocalypse” “end of the world” and so on. AD.com: You are enrolled in KDP Select and have given away many thousand free books but you also do a great job of selling Collapse at a higher price point (between $4.99 and $2.99 – currently $3.99) than most debut authors. To what degree do your number (and quality) of reviews and strong online presence help you command a higher price point? RS: I actually approached this from the opposite end of the idea you suggest. With a very solid, professional looking book cover the price of my book gives it the appearance of being a professionally published novel with a big publishing house. I have found by experimentation that when I lower the price, sales actually drop. Readers are very weary of indie authors, and a lower price point screams out indie. A median price range tells readers that this particular book has a certain quality and success to it. RS: Advertising. No one is going to read your book if they don’t know it exists. Indies swim in a vast ocean that no one cares about or even notices. The ones that manage to swim to the shore take every single chance to get noticed and even take calculated risks with paid advertising. I can also say that I’ve had a great deal of luck getting noticed by some influential people. AD.com: To what degree do you think KDP Select has boosted your discoverability? RS: Free promos are my bread and butter. I owe my success to KDP Select. AD.com: How do you leverage the following discoverability tactics? E-mail marketing: RS – Haven’t done it. Online advertising (niche websites, google, facebook, goodreads): RS – I’ve put a good deal of money into this and have found it helps a great deal. Blogging: RS – My blog is focused on helping other authors and the occasional blog post from me. I get between 400-800 views a day so it definitely helps with exposure. Your website: RS – Just have a blog. Goodreads: RS – Goodreads is still a mystery to me. It’s hard to gauge its effectiveness. Ebook promotions: RS – I’ve done a lot of giveaways and promotions on Facebook that have really put the word out there. AD.com: Do you have favorite on the above list – one tactic that has worked better than others? RS – I enjoy my blog the most. AD.com: Please tell us about Collapse and Resistance? 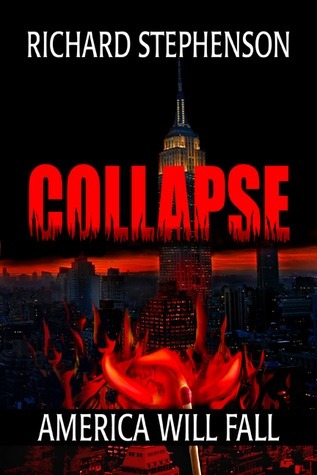 RS – Collapse is about the future downfall of America in the year 2027. The fall comes through a series of plausible events that could easily unfold in our own future. Resistance picks up 18 months after Collapse ends, with two sides fighting for the broken pieces of what’s left of the country. RS – Write because it is your passion with no expectations. Ad.com: Well there you have it folks. Richard’s keys to success have been actively seeking out Amazon reviews, maximizing Twitter (via Tweetadder), paying for and leveraging his professional cover into a higher price point, using paid advertising, KDP Select, and helping other authors via his blog. And he has still managed to market his book effectively while writing and editing the second book in his series! Thanks for stopping by Richard. Wishing you all the best with Resistance!